Update: We had a blast making cold process soap. 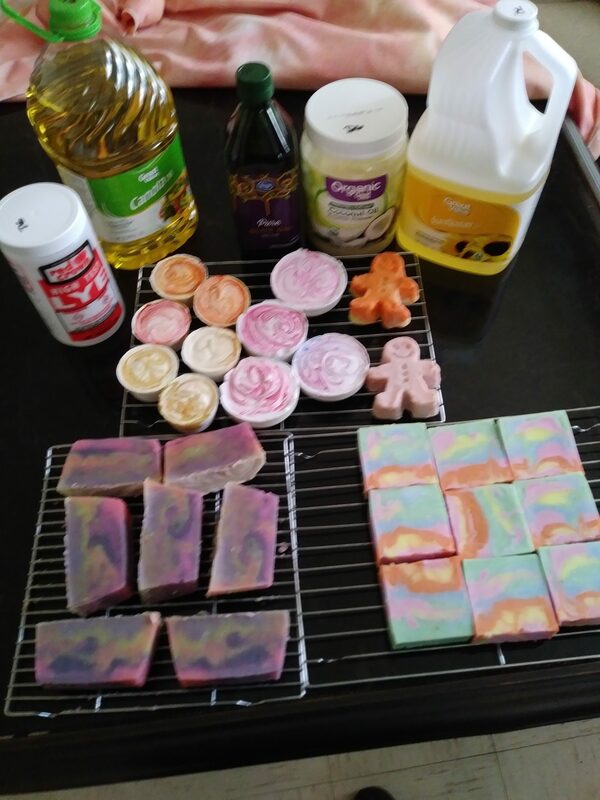 Here’s some resulting soaps. When: Saturday August 18, 2018, 9:00 a.m. – 3:00 p.m.
Where: Member’s home studio in Toney, contact the guild for driving directions. Supply Fee: Depends on how much soap you take home. Workshop open to adults and youth ages 16 and up. As a summertime change of pace, learn to make all natural handmade soap as we experiment with what we learned in the November 2017 workshop. This will not be “melt and pour” but “from scratch” homemade soap. Like grandma did it but better. You will learn to make your own soap. You’ll learn how to safely handle lye, the properties that the various oils give to soap, how to use scents and colors and how to make your own soap recipes. We will have the equipment and supplies for you to make your own soap to take home. Or, you can watch and learn. If you want to make soap, please wear clothes that could get dirty, long sleeve shirts, long pants and closed toe shoes if possible. Bring your own safety equipment: goggles, thick chore gloves and apron. Bring your own soap molds if you want something special. Email HsvFiber @gmail.com to pre-register by August 11 and reserve your supplies. You are welcome if you don’t pre-register, but there might not be enough supplies.